Sarah Waters appeared on The Bat Segundo Show #287. 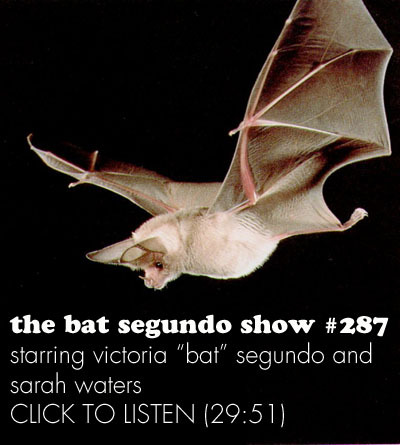 To listen to our previous interview with Sarah Waters, check out The Bat Segundo Show #37. 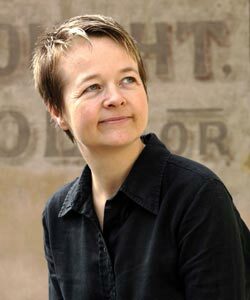 Sarah Waters is most recently the author of The Little Stranger. Condition of Mr. Segundo: Creeping into the dark shadows of fabricated identities. Subjects Discussed: Research involving poltergeists, country doctors, and other topics, lingering interests from The Night Watch, Susan Hill’s The Woman in Black, similar story elements across multiple novels, the limited elements of a haunted house story, dashed out four letter words, male consciousness in the postwar age, M.R. James, class relations and entitlement, job security, giant manses as characters, noun-heavy descriptions, science vs. faith, the eleventh-hour patriarchy in The Little Stranger, the value of empathy in relation to uncomfortable character qualities, character names, unintentional symbolism, Gyp the dog as a potential symbol of an Old World attitude, when a friend’s dog becomes menacing, writing about characters who could potentially live in the present time, the burdens of living memory and authenticity, on not drawing from real life, the KEEP CALM AND CARRY ON poster, tackling new genres, the paucity of contemporary ghost stories, and sustaining a cringe-worthy romance. Waters: He’s about to turn forty. Correspondent: He’s about to turn forty. But he’s very coy about this particular age. He’s constantly saying, “Oh, I can’t go up in there. Because I’m too old.” It’s nonsense! You’re forty years old. You could still — today, you could go to the gym. Waters: Today, you could go to the gym. But of course, in the 1940s, I think being forty was being middle-aged. People were older in their style and, even physically, kind of older. So I was very mindful that he’s of a different generation than Caroline — the daughter. He develops a bit of a romance with Caroline. But he’s definitely on the way into old age. I think that’s part of his problem. He feels that he’s been this boy. This young boy of enormous promise. The working-class boy who really clever people have picked him out, singled him out. He’s actually had all the advantages. But all they’ve done really is to alienate him from his own class. And he’s never really lived up to that promise. And here he is at forty about to enter into the second half of his life, not really having achieved very much. Which is why, I think, his exposure to the Hall is so crucial for him. Because it does open up something for him. Correspondent: But Seely is older than him. And he doesn’t concern himself with his age. Waters: Well, everybody’s different. It’s not like — for me, I was very interested in the doctor’s individual take on things. So he is a man who’s slightly apart from his colleagues. He has these quite pleasant colleagues. But they are family men. He’s not. He’s a bachelor. He’s quite a lonely figure really. Which again is why he fastens on to the Hall. Which actually was a problem for bachelor doctors. That people would often leave the family doctor alone. Because they knew that he had his own children, his own wife to take care of, and they’d go to the bachelor doctor. And I think the problem for doctors was that they were at risk for giving too much to their patients. That they had to guard against that. And I think that, to a certain extent, that’s what happens to Dr. Faraday. He gets sucked into this extraordinary Hall with these things going on in it.